An enormous fire engulfed Paris' iconic Notre Dame cathedral on Monday evening, destroying most of the 800-year-old wooden structure and leading to the collapse of its main spire. The blaze was a shocking event for the city of Paris, destroying one of its most famous buildings, built in 1482. The cathedral featured prominently in Victor Hugo's novel "The Hunchback of Notre Dame", which he wrote in 1831. 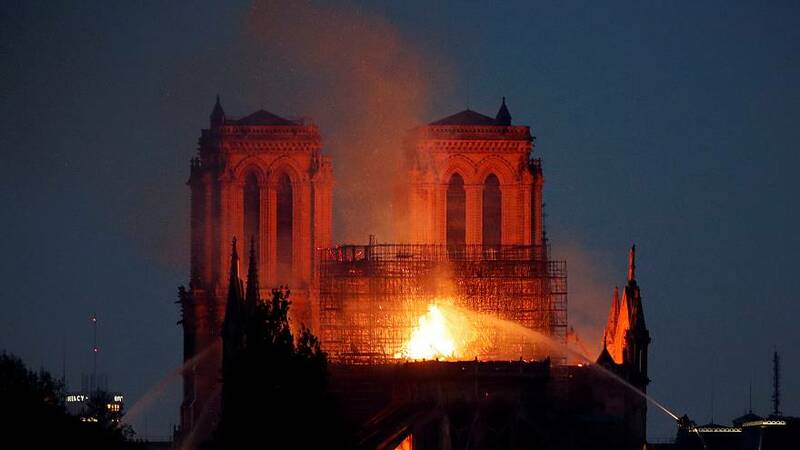 In the novel, Hugo, one of France's most acclaimed writers, describes flames in the Cathedral when Quasimodo uses fire and stones to attack Truands in order to save Esmerelda. "All eyes were raised to the top of the church. They beheld there an extraordinary sight. On the crest of the highest gallery, higher than the central rose window, there was a great flame rising between the two towers with whirlwinds of sparks, a vast, disordered, and furious flame, a tongue of which was borne into the smoke by the wind, from time to time. Below that fire, below the gloomy balustrade with its trefoils showing darkly against its glare, two spouts with monster throats were vomiting forth unceasingly that burning rain, whose silvery stream stood out against the shadows of the lower façade. As they approached the earth, these two jets of liquid lead spread out in sheaves, like water springing from the thousand holes of a watering-pot. Above the flame, the enormous towers, two sides of each of which were visible in sharp outline, the one wholly black, the other wholly red, seemed still more vast with all the immensity of the shadow which they cast even to the sky. Their innumerable sculptures of demons and dragons assumed a lugubrious aspect. The restless light of the flame made them move to the eye. There were griffins which had the air of laughing, gargoyles which one fancied one heard yelping, salamanders which puffed at the fire, tarasques which sneezed in the smoke. And among the monsters thus roused from their sleep of stone by this flame, by this noise, there was one who walked about, and who was seen, from time to time, to pass across the glowing face of the pile, like a bat in front of a candle. Without doubt, this strange beacon light would awaken far away, the woodcutter of the hills of Bicêtre, terrified to behold the gigantic shadow of the towers of Notre-Dame quivering over his heaths."